The autumn is my favourite time of year for new season shopping. 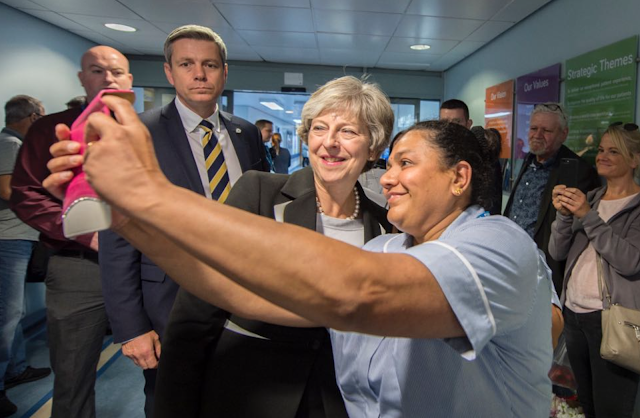 With the shops full of lovely new pieces, Theresa May has been taking full advantage of this season's fresh trends! The Prime Minister has added a few new pieces to her chic wardrobe, and we've seen many of them debuted over the past few weeks. Two blazers have been added to the Prime Minister's wardrobe. Both purchased in all likelihood from Fluidity, May has opted for earthly, autumnal tones. 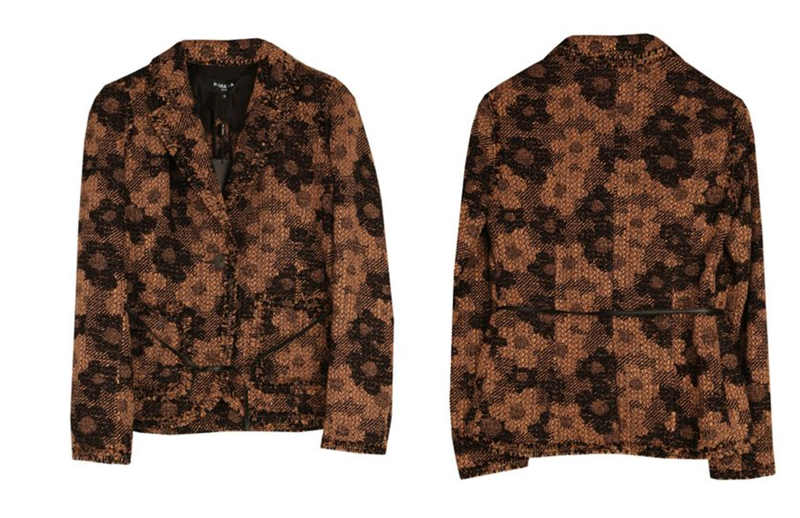 The first is the caramel tweed floral jacket from Paule Ka. Accompanied by a thin leather belt, May first wore this jacket when visiting the Alexander Dennis bus and coach company in Guildford. She's since worn it to the United Nations, teaming it with the leopard Delicious flats from Russell & Bromley. 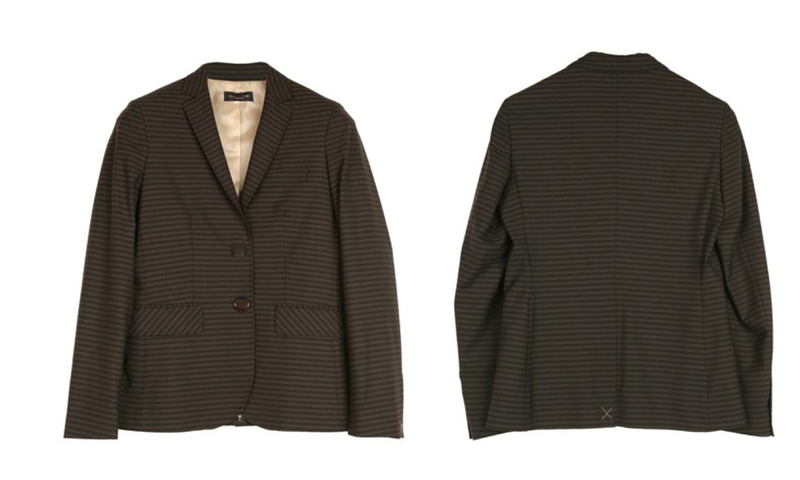 May's other new blazer is an olive and black striped number by Piazza Sempione. 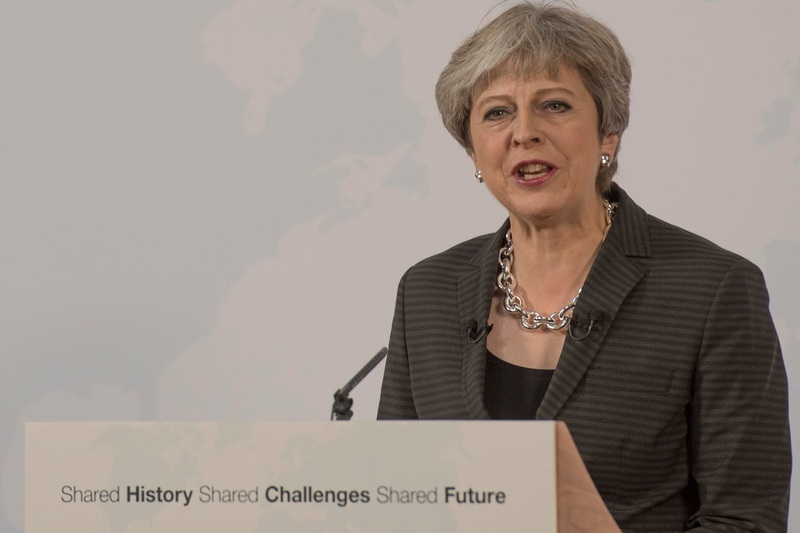 First seen during her Florence speech, May has worn this to the Conservative Party Conference and in the Commons. Theresa'a other Piazza Sempione purchase is the abstract pink, olive and blue dress that she has worn this month. Definitely different and really cute! And we can't forget her pretty powerful black and white colourblock blazer from Escada! You can read a previous post about the new addition here. May has also added some funky trousers to her line-up- the cropped flares come in black and brown and are a new take on an old classic! 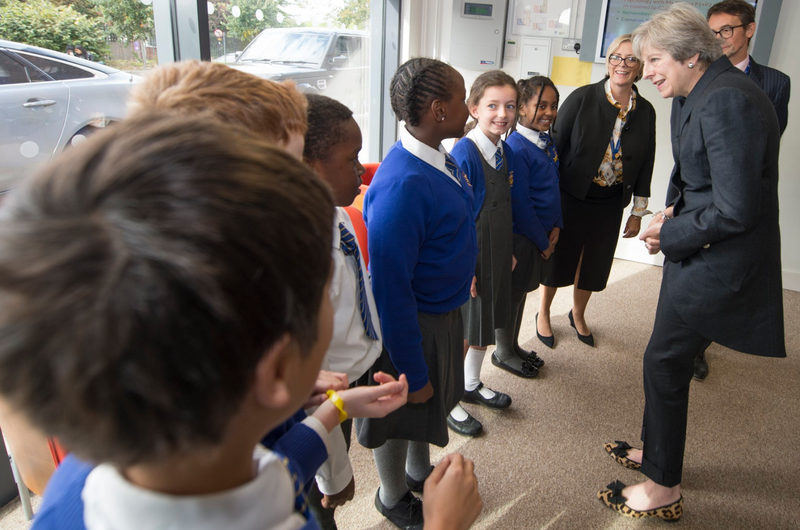 The PM has returned to Daniel Blake for some gorgeous tailored pieces. 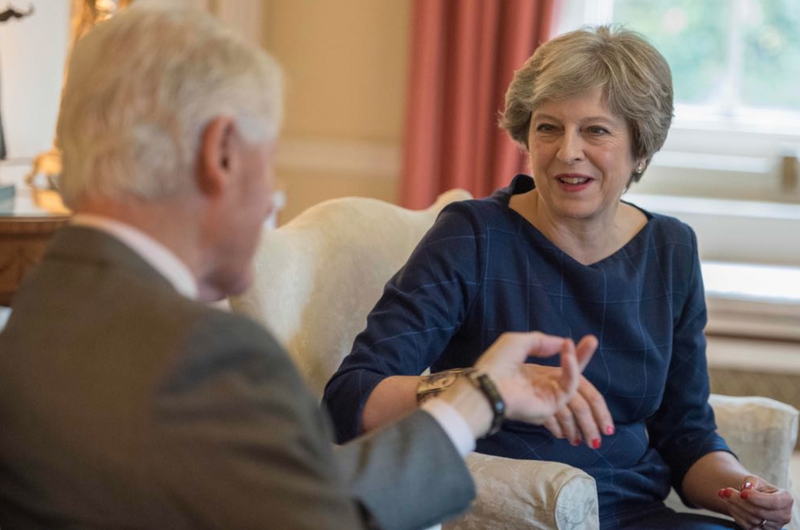 May wore the Tulip navy wool dress in windowpane check for her Conservative Party conference speech and to welcome Bill Clinton to Downing Street. 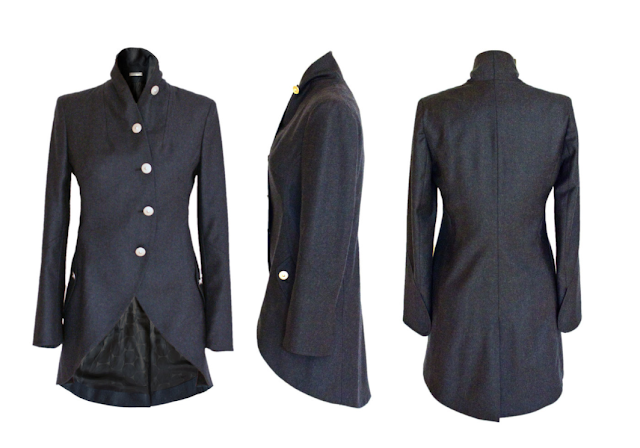 Blake has also created the Military Tail Coat in wool flannel for the Prime Minister. It is one of our favourites, and May wore it to the Dunraven School in London earlier this month for its first outing. So chic. It's not just clothes that have had a new intake. Theresa May has also added to her fantastic range of accessories. The PM has added three new Russell & Bromley shoes to her footwear collection. The fanciest, Humbug, were her shoe of choice for her Leader's Speech. The embellished teal kitten heels were adorned with bees, a particular nod to the Conference location of Manchester. May has also added two funky block heels to her collection. 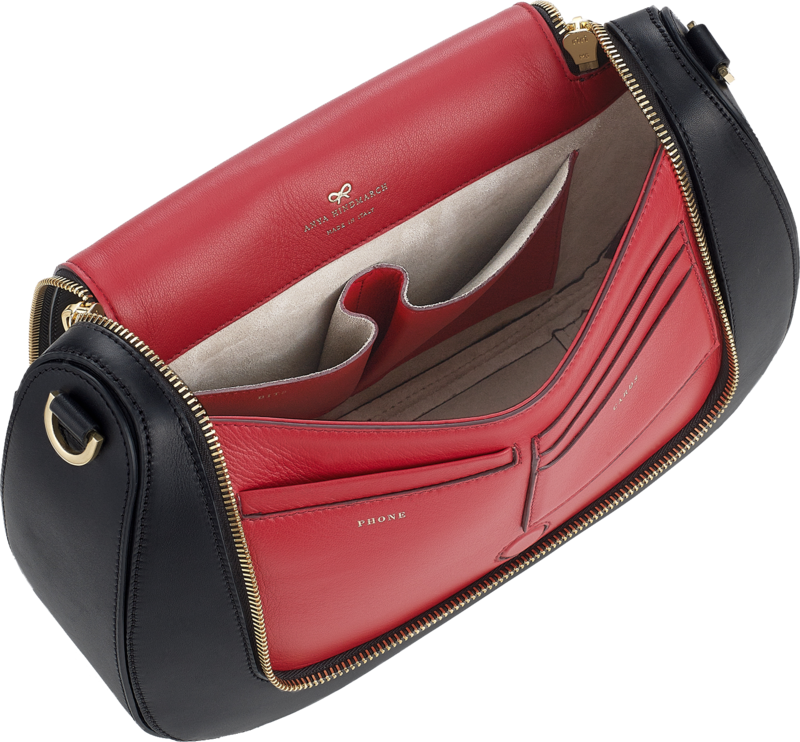 The Snaffle Trim Courts in vibrant red and purple- and a leopard version are so 'Theresa'- and I picked these out as possible selections when I first saw them at press day. 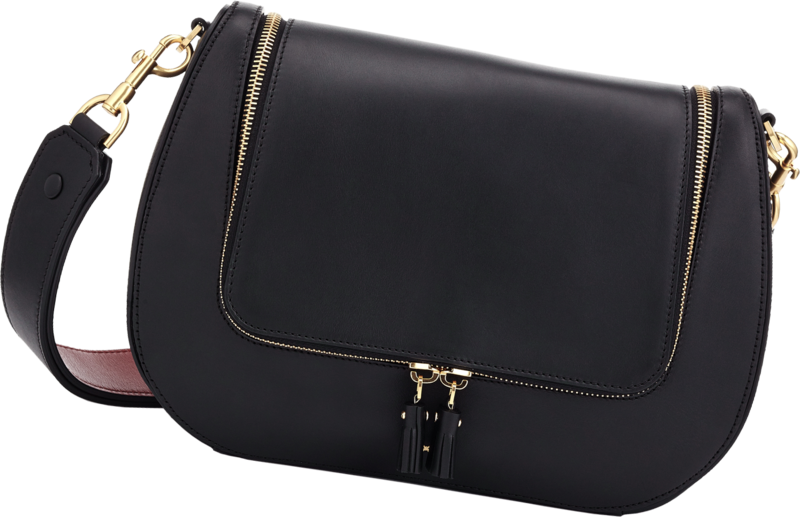 And perhaps the best find, and one which I am most excited by, is the PM's new Anya Hindmarch bag. 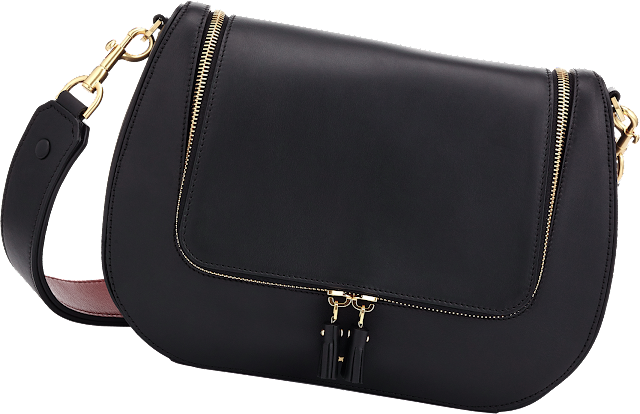 The Vere Satchel is so luxurious (I've been lusting over it for months!) 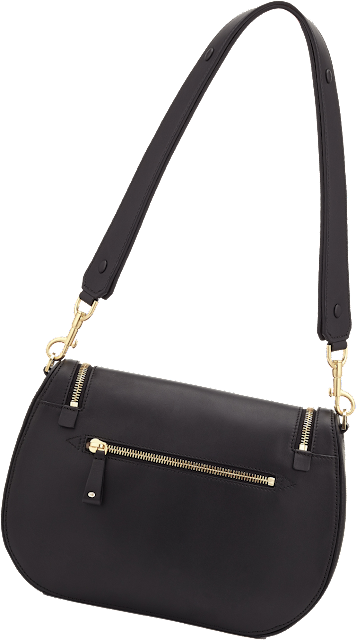 - and a really great workwear investment piece. The leather is super super soft, and the rich red lining and reverse strap is particularly fierce. A great choice by our fashionable Prime Minister! From Westminster to Norfolk. 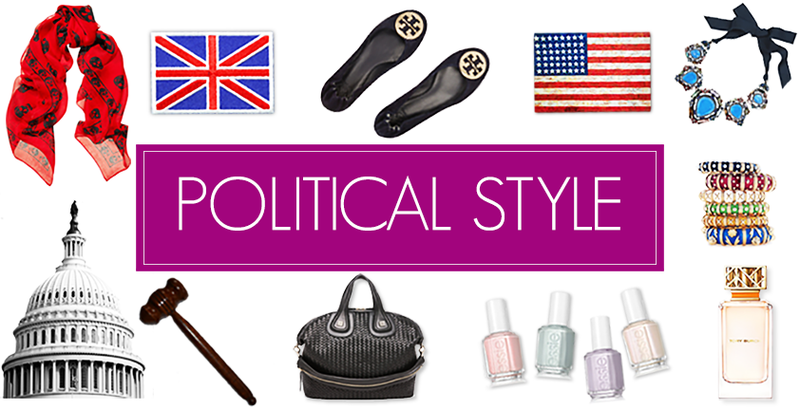 here's a recap of the Prime Minister's fashionable week! 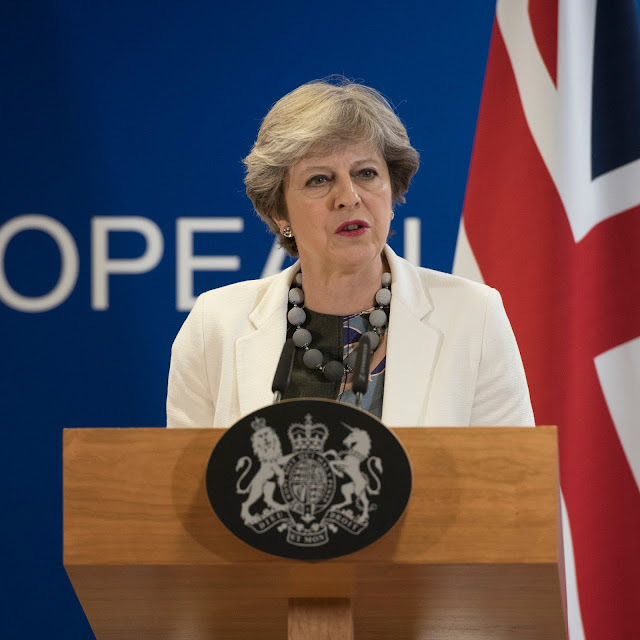 On Monday, Theresa May updated MPs and the House about the recent European Council meetings. The PM wore her olive and black Piazza Sempione blazer, teaming it with the cropped flared olive trousers. She accessorised with a chunky oversized chain necklace and debuted the fabulous leopard Link In block heels from Russell & Bromley and the Vere satchel from Anya Hindmarch. 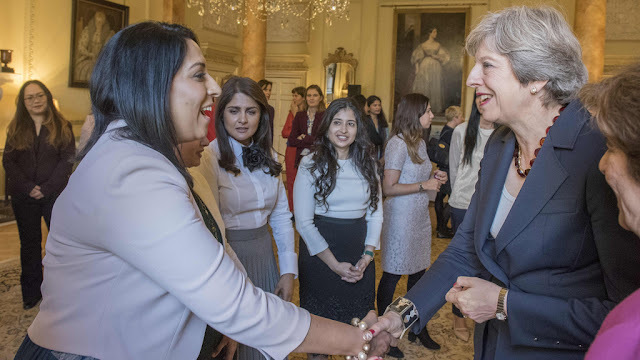 On Wednesday, the PM took part in Prime Minister's Questions and hosted an Asian Women of Achievement reception at Number 10. It was back to the staples- a navy Escada skirt suit and a garnet coloured jewel necklace. 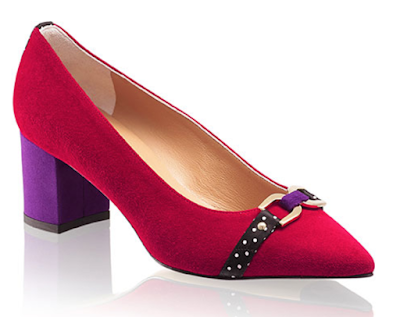 May wore the vibrant red and violet Link In block heels, again from Russell & Bromley. On Thursday, May visited Norfolk, visiting a housebuilding project to discuss mental health in the workplace. It was back to the Vivienne Westwood Blackwatch suit, and the sparkly heeled loafers! May also wore her swirl Caroline Johnson necklace. You'll have seen Pazuki mentioned many times on Political Style. 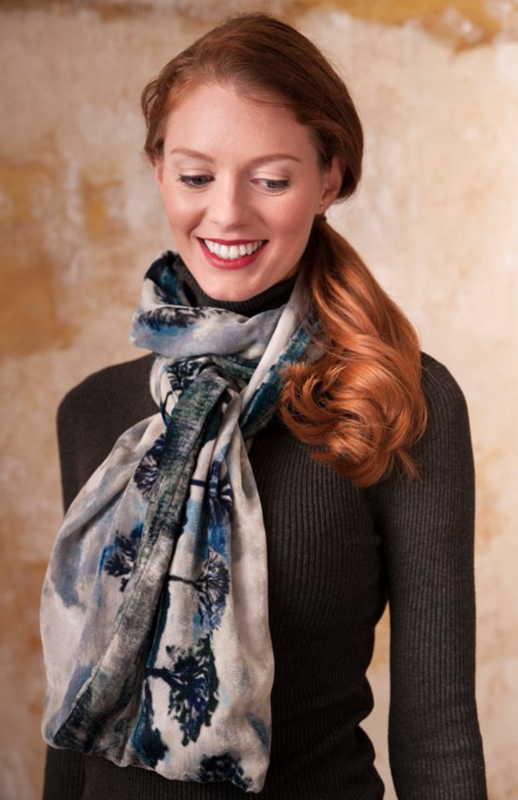 It's the Prime Minister's favoured scarf brand, and one which I'm really glad to have been introduced to! 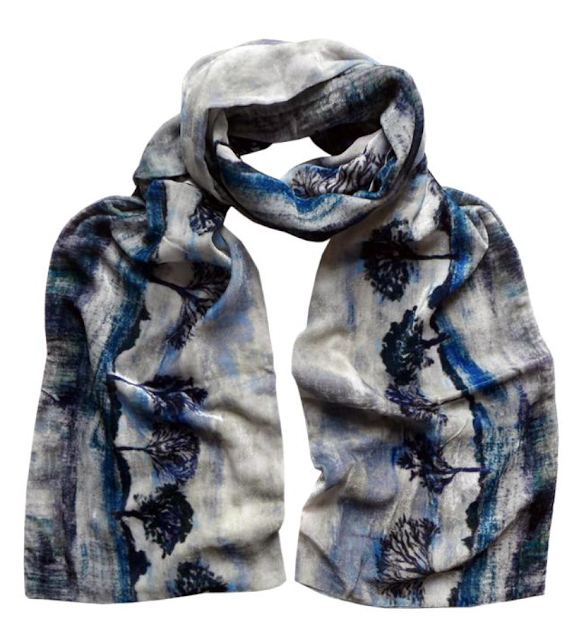 It's a great British label, and with the intricate designs based on paintings created by Pazuki's owner, it's no wonder that the scarves are firm favourites of fashionable women across the globe. Pazuki's AW 17 collection is mainly based on the oil paintings that the brand's owner, Pookie Blezard did last Autumn. Take a look at the website and you'll see that the originals were stuck on the walls for the look book shoot! The colours are particularly warm and earthy with quite an early last century bohemian look. 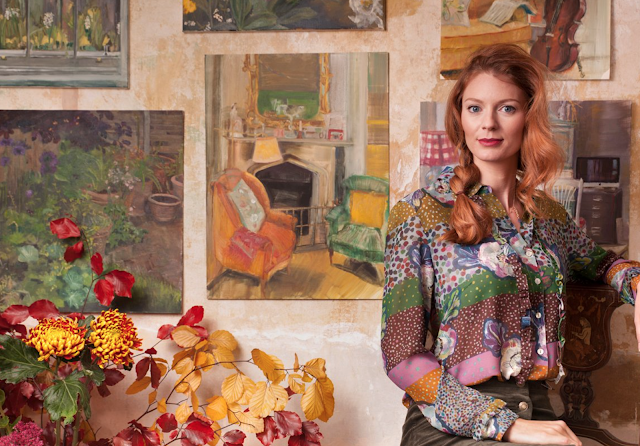 Pookie is passionate about painting in oils, having not done any since she was at art school, at Camberwell. Since the digital revolution it's been all too easy to use photographic imagery, and anyone can do it. She told me that she is finding it more interesting to create in paint, mixing colours on a palette and using expressive brushstrokes to create an individual and unique work of art. 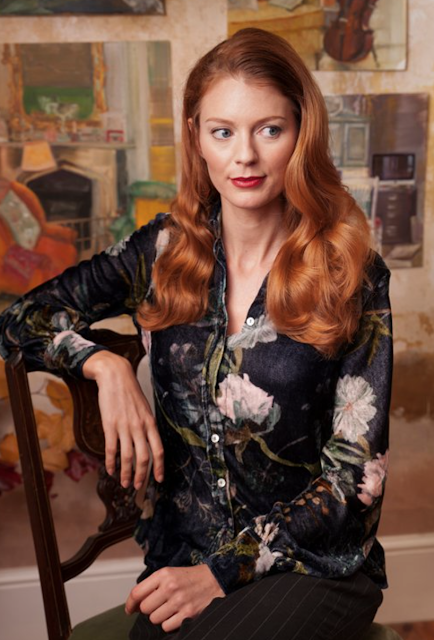 Pazuki's best selling print has been the Botanical flower print, all the flowers painted in oils and then scattered on a plain ground. 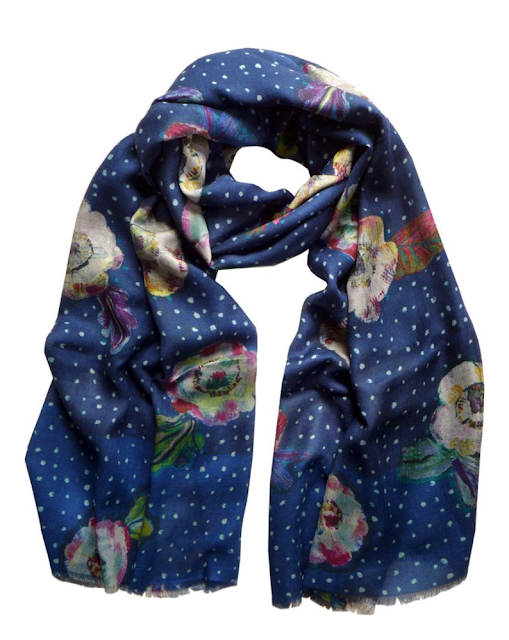 The navy version has been the best seller, and the red velvet is also particularly popular. So what is Pookie's favourite piece in the collection? "I'm also going to help myself to a navy shirt with bias cut sleeves in velvet!" 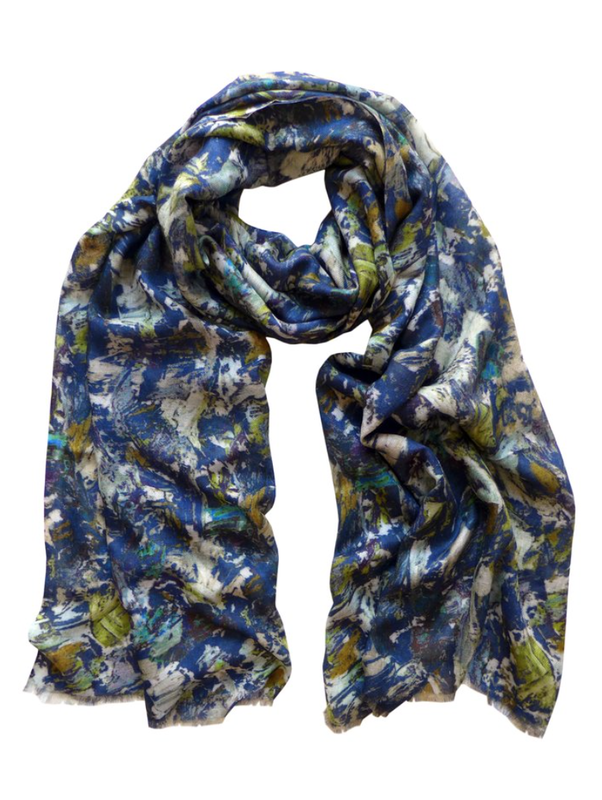 Political Style has teamed up with Pazuki to giveaway the Gravel Navy scarf in model cashmere to one lucky reader. To enter, use the widget below. Giveaway is open to all readers and closes on November 2nd. 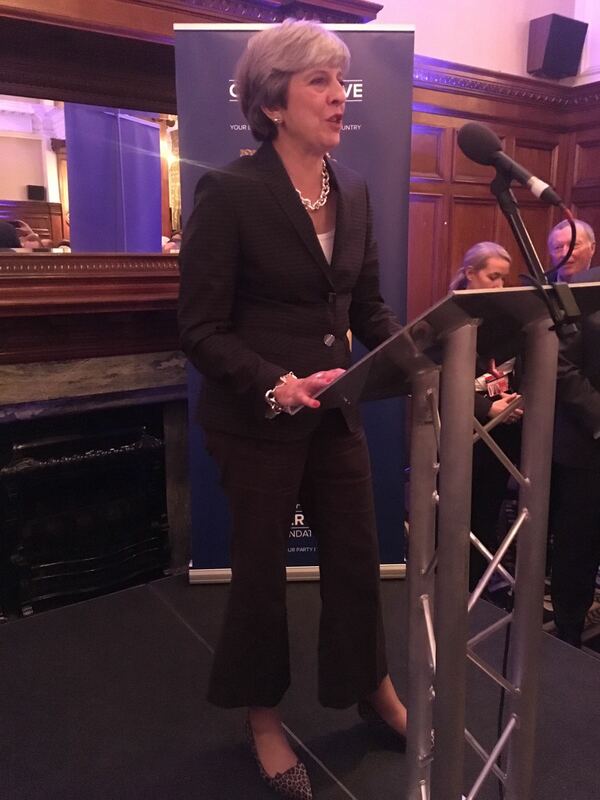 Once in a while, Theresa May will pick a piece that's very different from her usual wardrobe choices. We've seen her recently wear a new abstract print dress- it's a little out of character but still very chic! After hours pouring over dresses online, I think the olive, pink and blue dress is from Pizza Sempione. 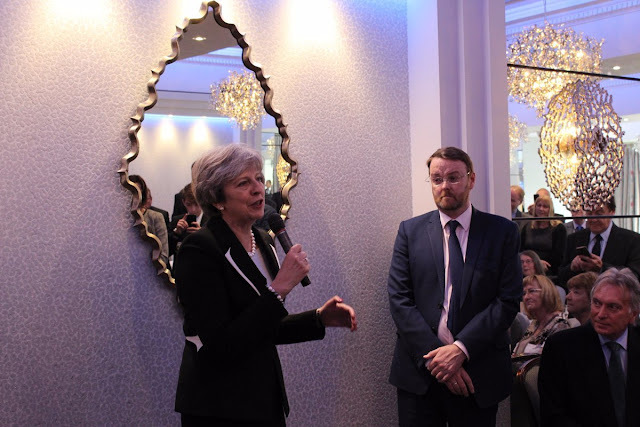 May has purchased a few Piazza Sempione pieces lately, notably the olive and black striped blazer she debuted in Florence and at the Conservative Party Conference. 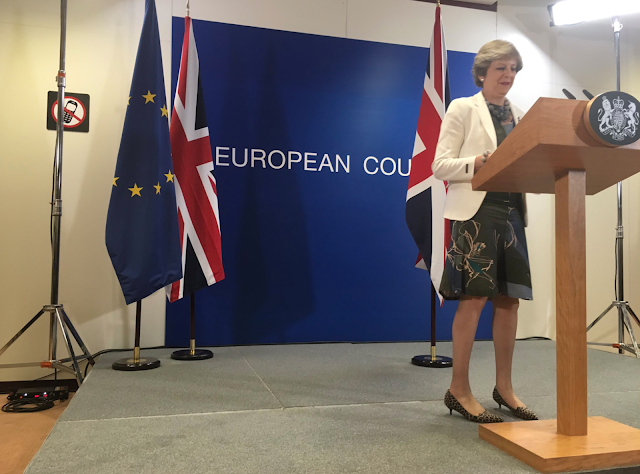 This jacquard dress with a full skirt isn't in line with the usual tailored pieces the PM will pick from Daniel Blake or Amanda Wakeley, but it's floaty nature makes it as eye catching. May has paired the colourblock abstract print with her bright white Peserico blazer, accessorizing with a grey fabric bead necklace, matching bracelet and the leopard Kitty heels from Charlotte Olympia. It could be one of our new favourite looks! And for those of you who are looking for the dress, we've found a similar version here. 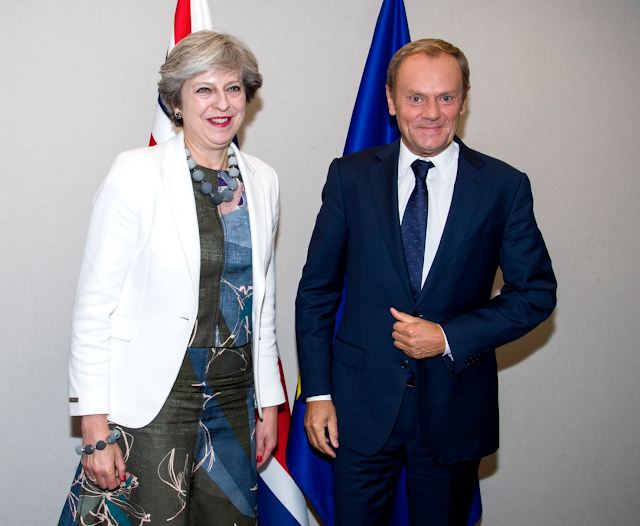 With two trips to Brussels, this week was a Brexit focused one for the PM! 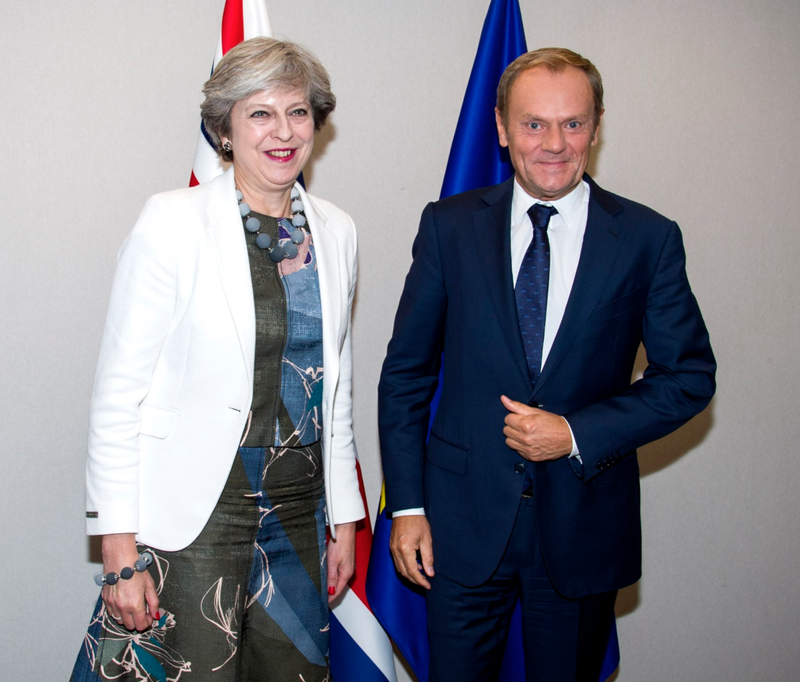 On Monday, Theresa May headed to Brussels for an evening meeting and dinner with the European Commission President. 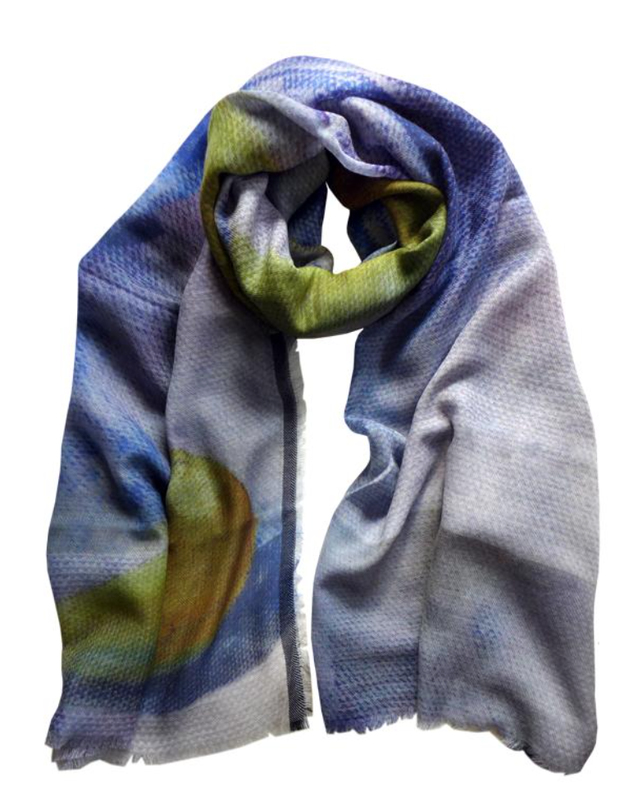 The PM wore her trusty purple Escada jersey dress, blue mac and her new Pazuki scarf. May also debuted a new pair of Russell & Bromley pumps- the Link In Snaffle Trim Courts in bright red and purple! 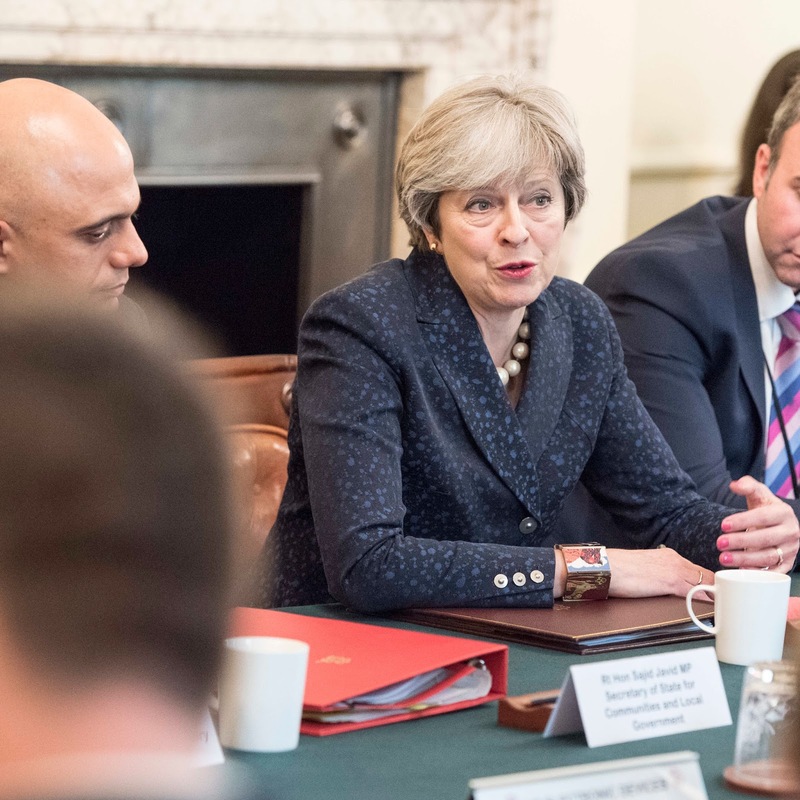 On Tuesday, Theresa May hosted a housing roundtable at Number 10. She wore her navy fleck Daniel Blake tailored jacket. 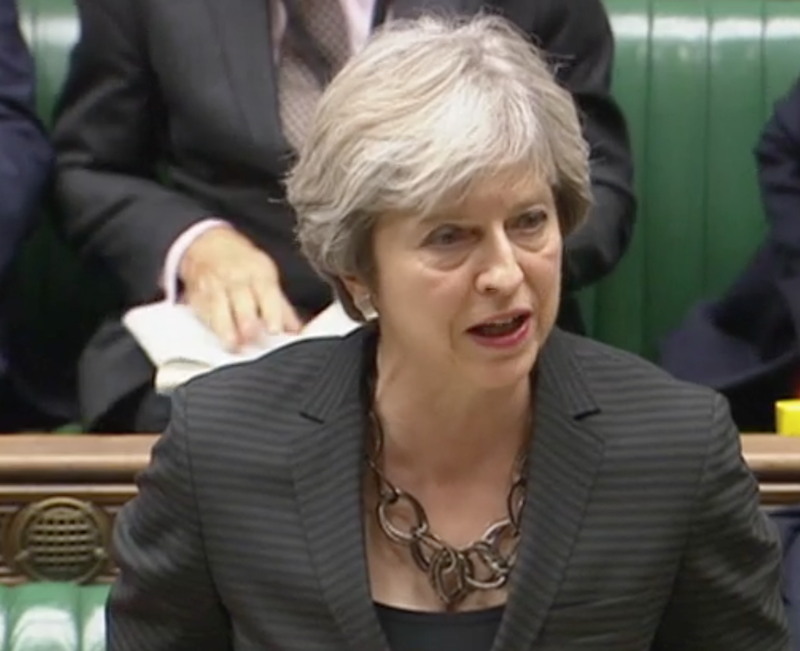 On Wednesday, the Prime Minister attended PMQs. 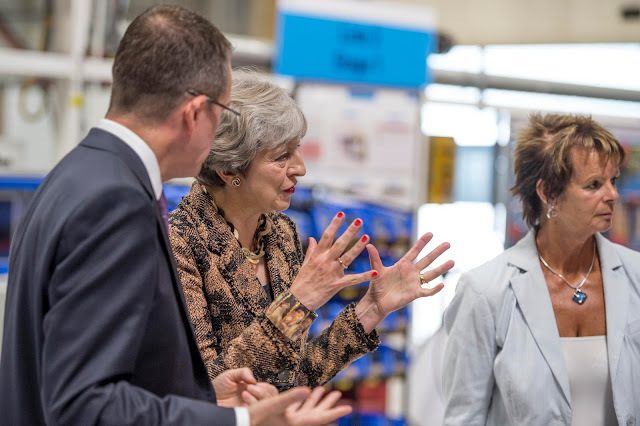 Wearing a textured navy long coat and dress, the PM accessorised with her Amanda Wakeley oversized chain necklace and bracelet, Amanda Wakeley Radford bag and the LK Bennett leopard kitten heels. 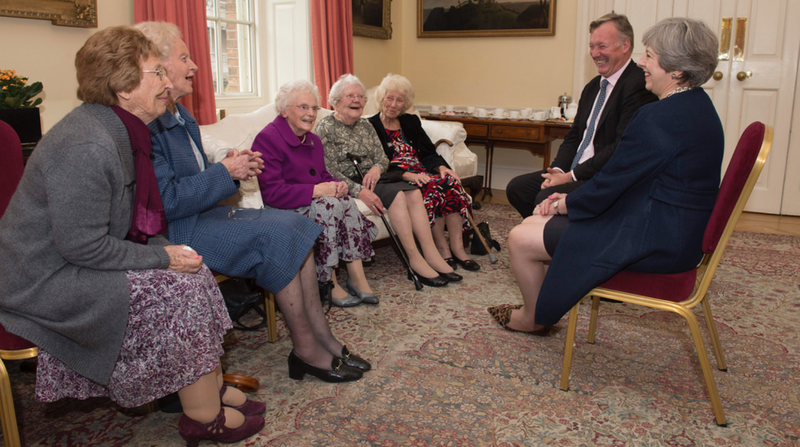 Later in the day, May wet with the Canary Girls at Number 10 before hosting a reception for Black History Month. She also attended the Pink News Awards and gave a speech. On Thursday, May headed back to Brussels for two days of European Council meetings. 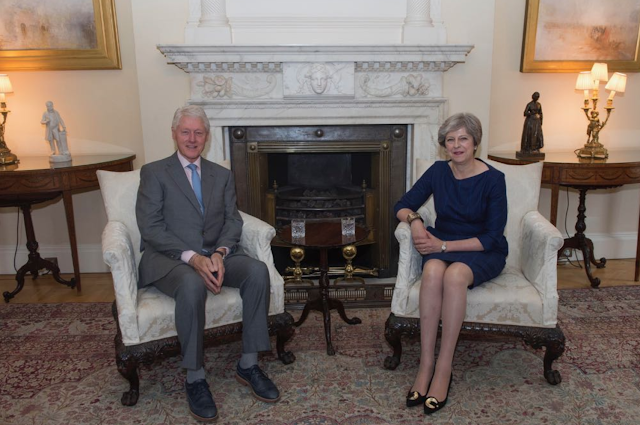 But before boarding her plane, she met with former President Bill Clinton at Number 10 to discuss the situation in Northern Ireland. May wore her windowpane check navy wool dress from Daniel Blake and the black Saucy pumps from Russell & Bromley. On Friday, May attended the second day of European Council meetings. Wearing her new patterned dress (we're on the hunt!) she teamed it with her bright white Peserico blazer. Theresa must have known it was Wear It Wild Day, accessorising with her Charlotte Olympia leopard kitten heels for a fierce look. She a matching grey fabric bead necklace and bracelet. 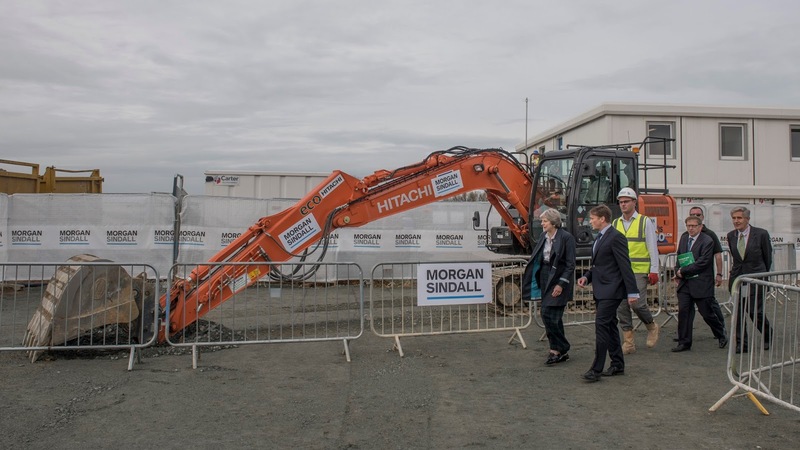 There's a new power suit in town, and it belongs to the Prime Minister. 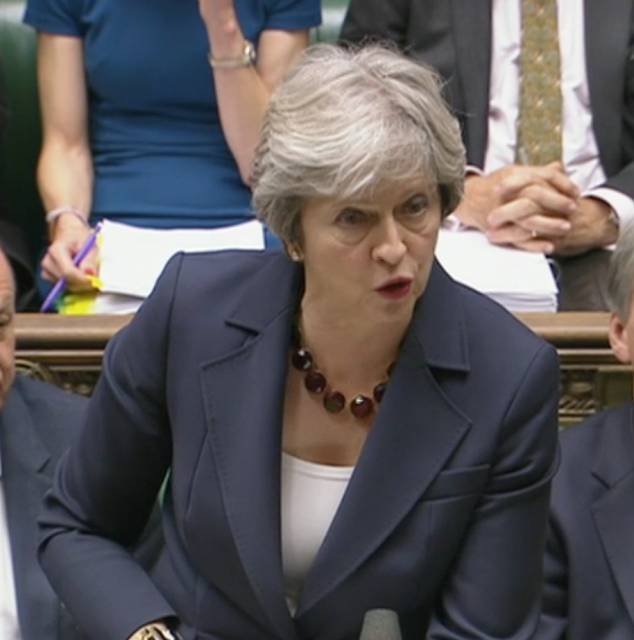 Theresa May first wore the black and white number from Escada in the Commons chamber a few weeks ago. Eagle eyed readers might have spotted it, but it took a little while to track down. She wore it to Liverpool this week- and we finally got a closer look! 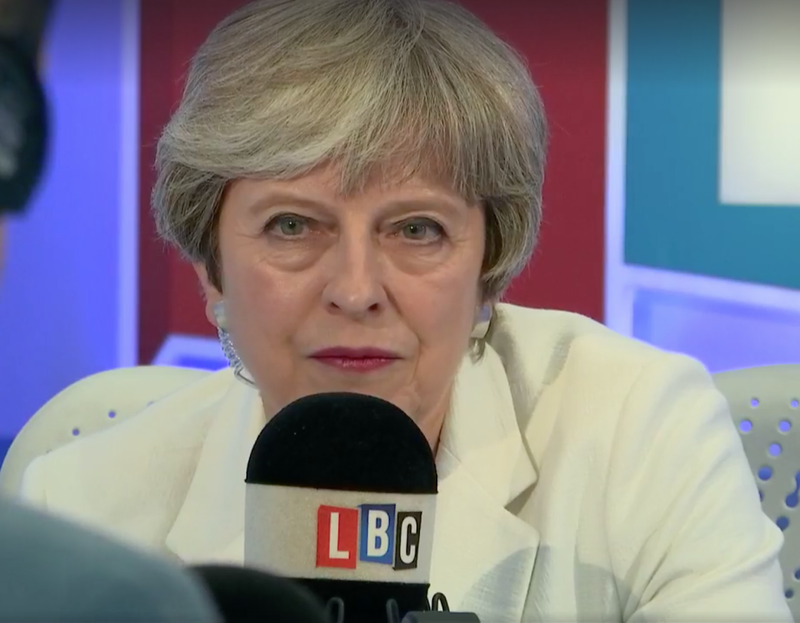 The colour block suit puts Theresa May in the company of Scandal's Olivia Pope, who is seen wearing the striking blazer in recent promos for the television show. It's also popped up on Annalise on How To Get Away With Murder. 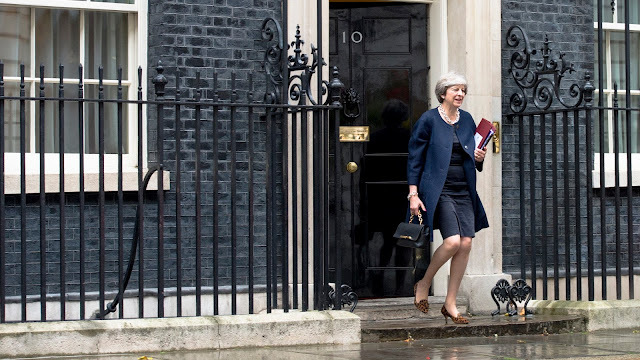 Theresa May is no stranger to Escada's mighty fine tailoring. The PM owns several blazers and skirt suits from the German brand, and it is stocked at her favourite Henley boutique, Fluidity. 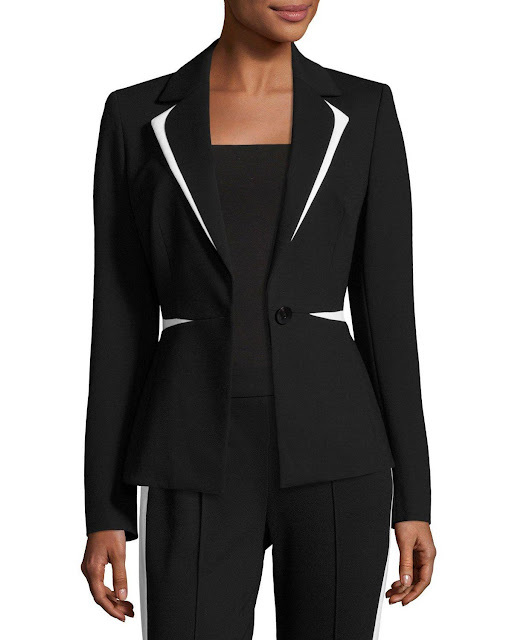 We particularly love this Escada blazer for its monochrome scheme and sharp lines. Another great choice! 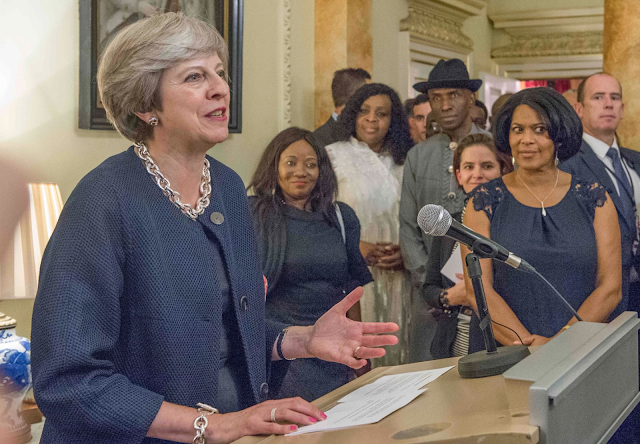 Theresa May was in London and Liverpool this week, launching the review into race disparity in the UK and unveiling a memorial for a fallen police officer. 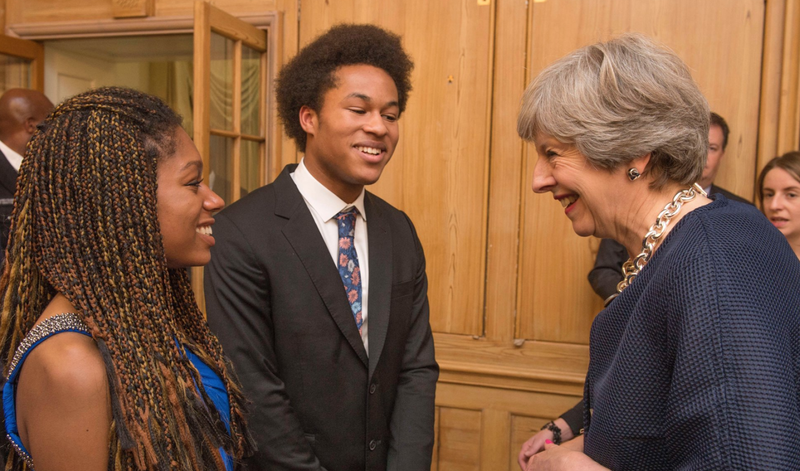 On Monday, the PM visited the Dunraven School in London, meeting with students and staff. 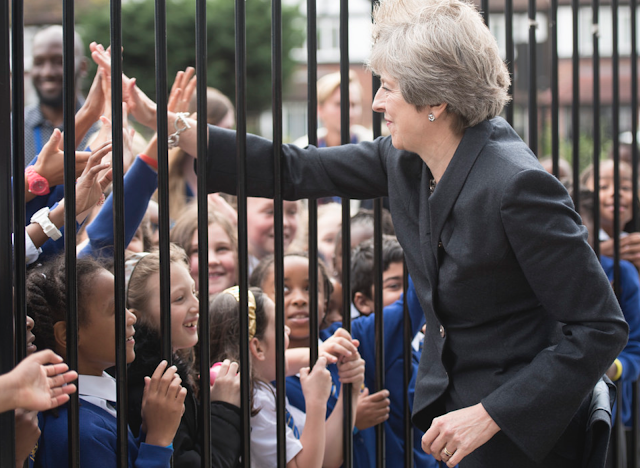 May debuted a new custom black jacket from Daniel Blake- the military, long line tailoring is superb! She teamed it with black trousers and the Delicious leopard flats from Russell & Bromley. She teamed this great look with a string of pearls. 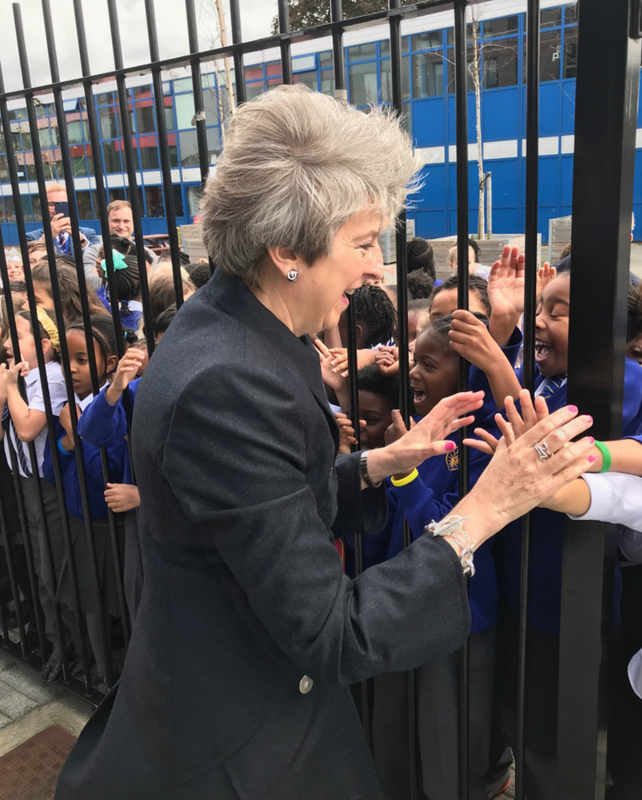 Later in the day, May answered questions about Brexit in the House. 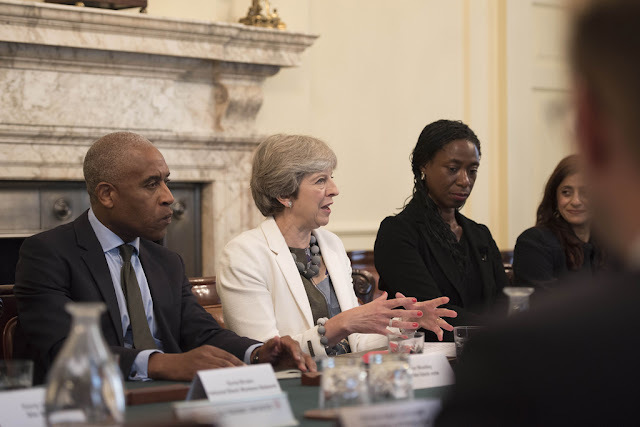 On Tuesday, Theresa May launched the Race Disparity Audit at Downing Street. You can read the report and its findings here. Later in the day, she participated in a live phone in on LBC. The PM debuted a new dress (we're still on the hunt!) teaming it with a crisp white Peserico blazer and an oversized grey fabric necklace and matching bracelet. 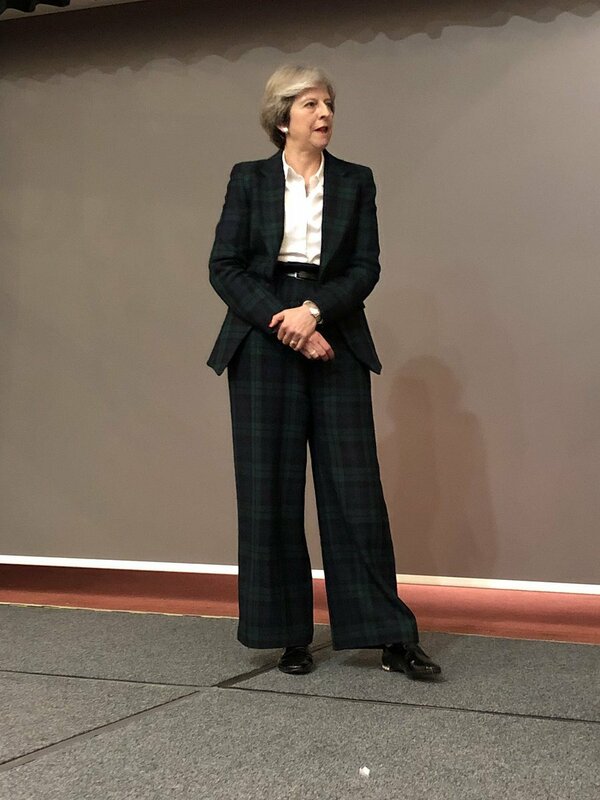 On Wednesday, the PM took part in Prime Minister's Questions, wearing an old faithful steel grey Vivienne Westwood trouser suit. Bubblegum pearls and the LK Bennett leopard kitten heels completed this look. 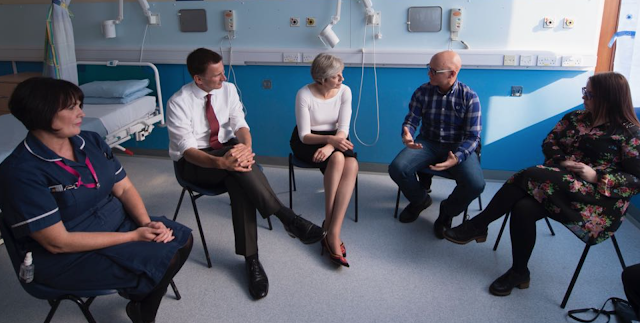 On Thursday, Theresa May travelled to Liverpool, visiting the Royal Liverpool Hospital's Transplant Unit. She also attended a ceremony unveiling a memorial to PC Dave Phillips in Birkenhead before attending some party events. 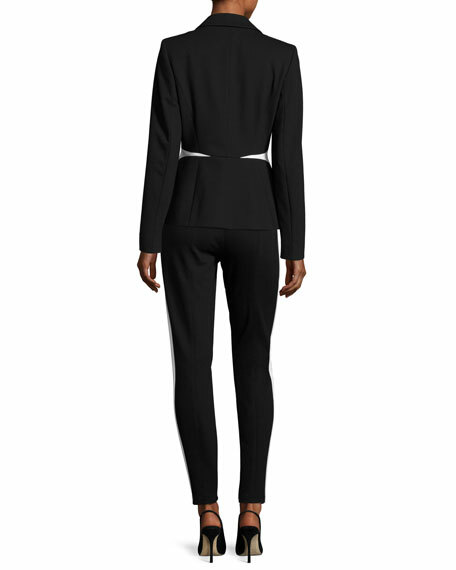 May wore her new black and white colourblock skirt suit from Escada. Eagle eyed fans of Scandal may recognise it straight from Olivia Pope's wardrobe. The PM teamed this power look with her embroidered Issa x LK Bennett kitten heels and pearls.